The impetus for sustainable development generally comes from local governments: they are the drivers of sustainability in cities and advocates of citizens’ needs. However, there are limits to what city leaders can achieve on their own. Many urban systems, including those of food, energy, waste, water and transportation, are partly or fully organized and managed by the private sector. Expertise on cutting-edge technologies, business and financing models often resides within the private sector too. Creating sustainable cities therefore requires the engagement of multiple stakeholders. City-business cooperation constitutes an enormous opportunity for both parties. Cities need private-sector involvement to address their urban challenges, improve efficiency, implement innovative solutions and access off-public financing. Companies, meanwhile, can benefit from a better understanding of cities’ needs and gain access to entirely new markets, which often represent lucrative business opportunities outside of their familiar fields of operation. But this requires that both local governments and businesses go beyond their individual interests and work together to solve urban challenges. Engagement between cities and the private sector is often limited to one-way interactions, seller-buyer relationships and rigid public procurement processes. Market engagement and dialogues for mutual understanding, or even joint implementation projects that tackle urban challenges in a multi-stakeholder approach through innovative cooperation models, are not as common. Institutional and perception barriers are challenging to overcome. Companies might see local governments either as the ‘restrictive regulator’ or as the ‘affluent customer’ to sell their products to – not so much as a potential business enabler and facilitator between the needs of a city and the solutions provided by the private sector. Local governments in turn might see businesses as profit-hungry sellers of technology that lack understanding for the complexity of cities – less as flexible and innovative problem solvers that can effectively address the needs of a city and its people. City officials and company representatives often speak different languages. They focus on different aspects of urban challenges and operate according to different time frames. But in times of ever increasing complexity and integration of urban systems, not least through the recent hype of Smart City initiatives, local governments and businesses – along with academia and civil society – need to understand that they are all stakeholders in the same game. They need to get together and reflect on their roles and their abilities to solve urban challenges. Individual interests, such as private sector profit and political achievements, will be byproducts of their joint efforts to address urban challenges. We need a better understanding of new cooperation models and facilitation processes to enhance city-business engagement at the strategic level. This was highlighted in the findings of the joint survey of city leaders and senior officials which ICLEI published in collaboration with the World Business Council for Sustainable Development (WBCSD) in September 2014. Now ICLEI and WBCSD are conducting a study on city-business cooperation models to improve this mutual understanding and show pathways to improve trans-sector cooperation. It will draw on the best practices from both organizations’ projects and member initiatives, showcase examples of city-business engagement and analyze potential for replicability. One successful example that will be featured in the study is the redevelopment of Bottrop, Germany, from an industrialized to a low-carbon city under the InnovationCity Ruhr Initative. Since 2010 over 200 novel ideas and projects have been developed through active public-private partnerships. These range from the installation of 100 combined heat and power systems to extensive retrofitting activities. The launch of the report will coincide with a sub-plenary session at the ICLEI World Congress 2015, which will be held from 8-12 April in Seoul, Republic of Korea. 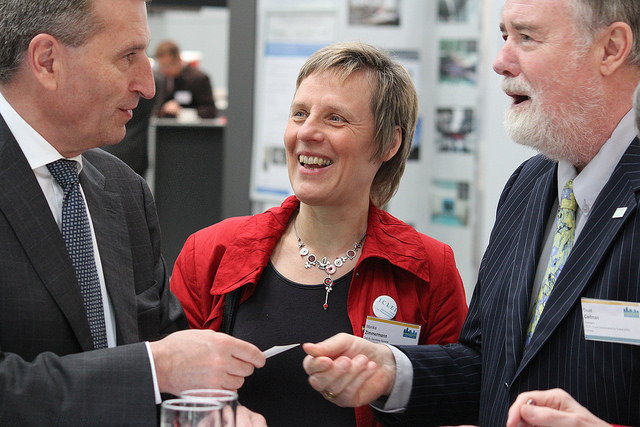 Günther Oettinger, David Cadman and Monika Zimmerman at Metropolitan Solutions 2014. Conferences and events provide a great platform for city officials and business representatives to meet and engage in city-business dialogues, to increase their mutual understanding and to improve their cooperative relationship. To unlock their full potential, however, these events need to more actively facilitate city-business dialogues and interaction through innovative formats. 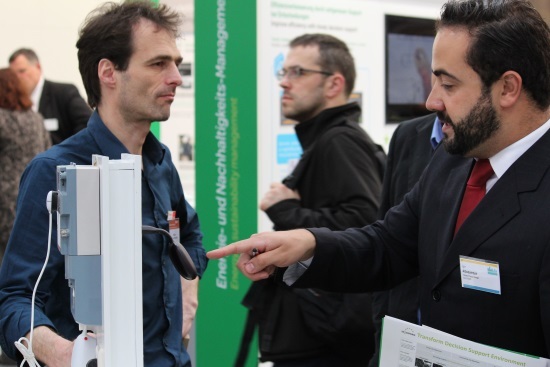 ICLEI Lounge Talks at Metropolitan Solutions 2015, which will take place on 20-22 May in Berlin, Germany, will offer a unique opportunity for exchange. In 30-minute roundtable discussions, table hosts from cities and businesses will present their projects, products, urban challenges and business expertise. The informal and personal setting will be ideal for fostering mutual understanding between cities and businesses, as well as for developing personal contacts for partnerships and collaboration opportunities. Roman Serdar Mendle coordinates the activities of the ICLEI World Secretariat in Bonn regarding Smart Urban Infrastructure and City-Business Dialogues, which are related to a variety of urban sustainability discourses such as Smart Cities, Productive Cities, Urban Sytems, the Urban Nexus and Industrial Ecology.